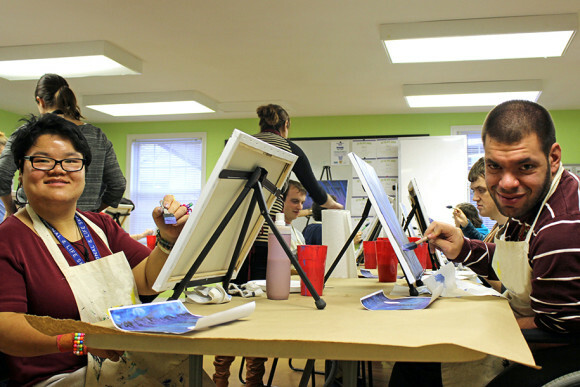 Day Program members Yan Qin Keller and Josh Buglione participate in a painting activity. Photo by Vanessa Pereira. WESTBROOK & MADISON — Vista Vocational & Life Skills Center, a nationally accredited community-based education program for individuals with disabilities, is hosting an Open House for its Day Program on Tuesday, Jan. 19, 2016 from 3 to 6 p.m. Offered Monday through Friday from 9 a.m. to 3 p.m., Vista’s Day Program is a structured experiential day program in a peer-based setting. Participants in the Day Program enjoy a fulfilling and active schedule that includes work experiences, arts programming, group instruction, fitness, social skills training, outings and more. The Day Program Open House will include a guided tour of Vista’s Madison Campus as well as the opportunity to meet Vista leadership and hear from current Day Program members about their experiences. This free event is ideal for families, friends, school district representatives and Department of Developmental Services caseworkers, but is designed for anyone interested in learning more about the program. Based in Madison and Westbrook, Vista has been assisting individuals with disabilities achieve personal success for over 25 years. Accredited by the National Commission for the Accreditation of Special Education Services (NCASES), Vista provides an array of services to over 300 individuals and their families. Its population is comprised of individuals with autism spectrum disorder, learning disabilities, seizure disorders, traumatic brain injuries, intellectual disabilities and ADHD. To RSVP for the Day Program Open House, contact Vanessa Pereira at vpereira@vistavocational.org. Registration is also available online at www.vistavocational.org.